Yuriy Simakov and Oksana Klyuchnyk are owners and professional dance instructors of CarolinaDance Studio in Raleigh, NC. It was at the age of 7 that Yuriy and Oksana started their dance careers. Oksana competed and became either the winner or finalist of a large number of National and International Dance Championships, in the Ballroom and Latin programs. While at the same period, Yuriy, at the age of 12, became the champion of the Ukraine for his level. In his competition journey, Yuriy won numerous International Ballroom Dance Sports competition in Russia, Germany, Poland, Bulgaria and Czech Republic. Oksana was a member of the Ukrainian Dance Team. She has represented the Ukraine at the European and World Dance Championships in Germany, Holland, Poland and Russia. Oksana was awarded the title Master of Sports by the Ukrainian National Sports Committee, in recognition for his excellence in Ballroom Dancing. Relating to their studies, Oksana has been graduated at the top of her class with a major in dance, from one of the most prestigious schools, University of art. She obtained additionally a Bachelors Degree in Pedagogic. Yuriy also graduated from the Kharkov National University of Art with a major in Dance. During his time in the Ukraine, Yuriy has founded “Evrika”, a Ballroom Dance Studio.His students became winners of numerous National and International contests such as Blackpool competition in England (junior category), Czech Republic (juveniles and junior category), Poland and Germany. In addition to this commitment, Yuriy was the organizer of International Classification and Rating Ballroom Dance Sports Competition Severskiy Donets in 2001 and 2002. In 2003, Yuriy Simakov and Oksana Klyuchnyk came to the USA and found a Ballroom Dance in the Raleigh and Durham, NC area. Their relationship later blossomed into marriage and they become proud owners of the CarolinaDance Studio in Raleigh and the Fred Astaire Dance Studio in Durham, NC. 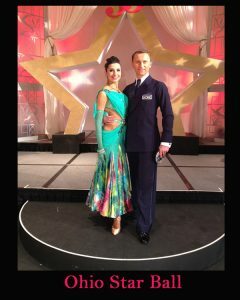 Besides teaching how to dance, the couple is also still actively competing at the highest level all over the USA. Together, they bring their knowledge and excellence to the Triangle area in NC. US Rising Star Smooth winners and finalist: Heritage Classic 2007 (3rd Place), Carolina Classic 2007 (1st Place): Millennium Dance Sport 2007 (2nd Place): Atlanta Open 2007 (4th Place): Carolina Classic 2008 (2nd Place), Heritage Classic 2008 finalist, Manhattan Dance Sport Championship 2008 finalist. Published in newspapers and magazines: Herald Sun, News and Observer, 15-501, and Skirt.